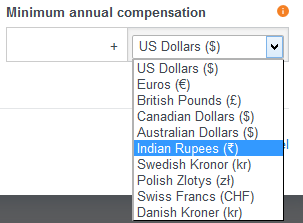 In the Jobs -> Match Preferences -> Minimum annual compensation section the salary currency dropdownlist having country wise currency along with it's sign. Indian rupee sign is missing from this list. After inspect the dropdownlist element I see the option is not having the INR sign ₹ in it. Filling the ₹ in the option will work fine. The symbol is now displayed: Indian rupees (₹). (INR) will be shown instead of () in the next build (build rev 2016.5.25.4556 on MSE/MSO, 2016.5.25.3612 on sites), fixing the immediate bug. We'll evaluate adding the symbol to our currencies table in careers, though. Not the answer you're looking for? Browse other questions tagged bug status-completed jobs developer-story .